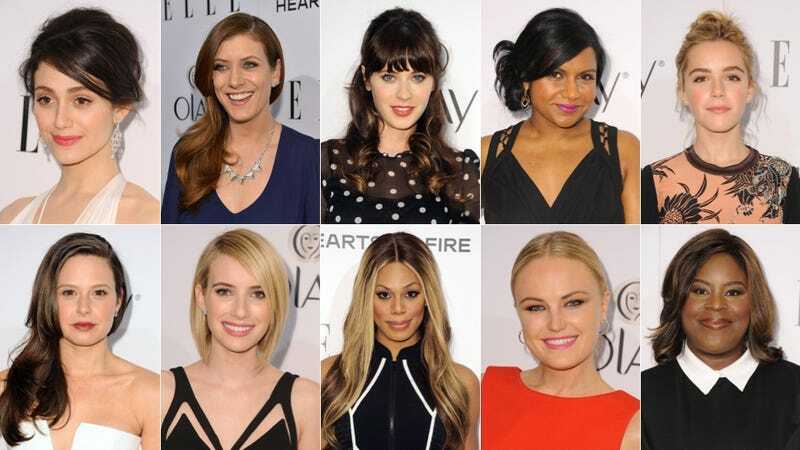 Elle's Women in Television celebration was held last night in West Hollywood and my stars, everyone looked so pretty. Deliciously creamy retro 60s shift dress (by Dolce and Gabbana) on Emily Wickersham of NCIS, love the textured updo, and the rococo gold clutch is divine. Gah. Shameless star Emmy Rossum and Scandal star Katie Lowes look amazing — all dark hair, ruby lips, ivory gowns. A+ for stripey shoes! Nazanin Boniadi of Homeland is simply stunning in an asymetrical ecru number; Jenna Dewan Tatum of The Witches of East End rocks a prommy frock. Some lacy/sheer/illusion stuff: "Real" "Housewife" NeNe Leakes; Yael Stone aka Morello of Orange Is The New Black; Once Upon a Time's JoAnna Garcia Swisher; Uzo Aduba aka Crazy Eyes of OITNB. Fab little black dresses for Mindy Kaling and Jenna Elfman. More black and white, fitted and swingy: Alexandra Daddario of True Detective and Laverne Cox of Orange Is The New Black. Ebony and ivory in harmony for Emma Roberts of American Horror Story and Retta of Parks and Recreation. Black with peek-a-boo skin: Food Network's Giada De Laurentiis, House's Odette Annable; Elle editor-in-chief Robbie Myers. Still unclear about the return of the crop top? Let The Mindy Project's Xosha Roquemore and Extra's Maria Menounos show you how it's done. Sadie Calvano of the CBS show Mom and Tracie Ellis Ross. Kate Walsh, radiant in navy. Party-perfect embellished dresses for Meghan Markle of Fringe and Suits and Samira Wiley aka Poussey on Orange Is The New Black. Springy Easter colors in January? Sure! Bella Thorne of Shake It Up in sunny yellow, Zoe Jarman of The Mindy Project in speckled egg and Constance Zimmer in Jordan almond blue. Brightening things up and making me jealous I am not in a climate where this is appropriate because I really want to wear it: Trophy Wife's Malin Akerman. Finally, impeccable as always, Mad Men's Kiernan Shipka. Fun dress, pretty hair, beautiful makeup, fourteen years old!